I’ve just finished reading A NOVEL BOOKSTORE by Laurence Cosse, and although it is not a perfect novel itself, it certainly made me think about what makes a good novel, and who decides on it? 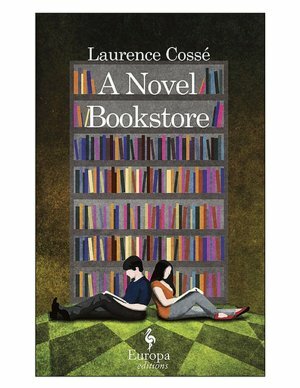 A NOVEL BOOKSTORE is a quirky story that will get the attention of any book lover. The two main characters, the wealthy, beautiful, but also very sad Francesca, and the incredibly well read, but also a bit gruff Ivan, are seriously committed to the idea of great literature in everybody’s life. While bemoaning the current state of disenchanted book selling and cynical publishing,they decided to act in defence of all the great booksthat do not make it to the best-sellerslist and often do not make it to the bookshops either. After months of research and planning they open their own store in Paris. It is called The Good Novel, and it only sells “good” novels. The booksin their store are selected by a committee of literary novelists and bookcritics, so secret and anonymous that the members don’t even know who else is on the committee. Initially, the store is a huge success but their luck turns quickly and the store, the committee members and the owners all become victims of a major and quite violent campaign against the very idea of the existence of such an institution. The better part of this book becomes an investigation into the culprits and reasons behind the campaign. I’ve spent most of my life working as a bookseller and I’ve spent all of my life reading, so this book got me really thinking about what is my definition of a good if not great novel. You won’t be surprised to know that I cannot find a simple answer. We all read for different reasons and we no doubt all have very different definitions of “good”. From my own readingexperience, I readsome novels for their story line, one that can transport me completely into another realm; I readother novels for the sheer beauty of their language, and sometimes I read purely to be entertained. There are some books that I read 20 or even 30 years ago and I still remember them like yesterday while there are others where I can’t really recall the details, but I have a very vivid memory of a very enjoyable experience while readingthem. These are all good novels in my opinion because they all allow me to be someone else and in the end they all contributed to the person I have become. I would be dishonest if I said that I did not think that there are some awful booksout there, but whenever I think that I always remind myself that every bookhas a readerand one of the most fantastic things about booksand stories is that once they are published they belong to readers. We each individually view them as different stories depending on our experiences. And, who really has the authority to say that these are good or not good for us. This of course leaves all of us with the dilemma of how to decide what to read next? If you are pondering this question while reading this blog then I invite you to check out our site. You will find here recommendations by like minded readers, read about books that others loved and shared and you can also check out new releases book reviews and sample chapters. …. and as for A NOVEK BOOKSTORE…. readit and decide for yourself whether it is a “Good Novel” or not.